Just got yourself a nice pair of reference monitors? Great! Your next purchase needs to be a nice pair of monitor stands to mount them on, and the On-Stage SMS6000 adjustable monitor stands represent a top-quality solution at a great price. On-Stage SMS6000 monitor stands are height-adjustable from 36 to 52 inches, with a 9"-square top platform to hold speakers up to 100 lbs. All near-field reference monitors have a sweet spot, and unless your head is positioned directly in it, you're not hearing your mix the way it really sounds. There are two ways to make sure you're listening to the sweet spot during playback: rest your head on your desk to be level with your monitors, or bring you monitors up to your ear level. Unless you look forward to premature back failure, the latter is the preferred solution, and these SMS6000 stands are the perfect monitor placement tool. Because they're adjustable, you'll be able to sit however you're most comfortable and still be listening right in the sweet spot. Placing a reference monitor too close to a wall or corner can greatly distort its audio reproduction. A nearby wall can unnaturally boost bass frequencies by 3 dB, and corners by 6 dB. Even though some monitors have sophisticated built-in room compensation controls, it's best to not have problems to compensate for in the first place. With this set of monitor stands, you'll have complete placement freedom for your speakers, independent of where your desk or any other furniture sits in your control room. Chances are your reference monitors represent a significant investment, but you won't have to think twice about resting them atop a pair of On-Stage SMS6000s. 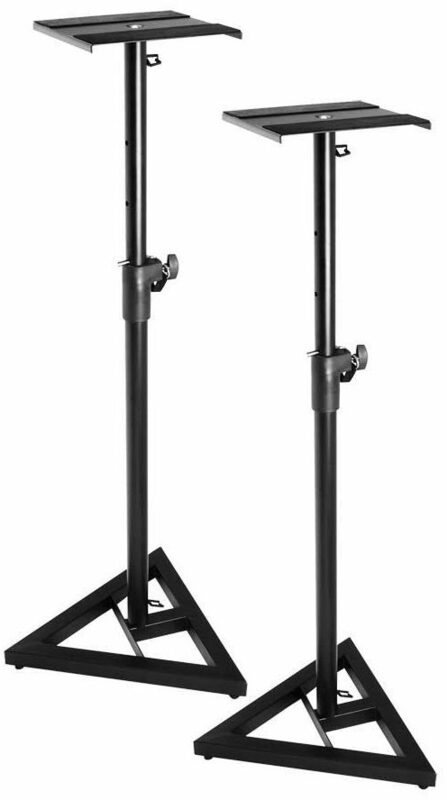 These stands are rated to support up to 100 lbs. each, and the wide, triangular base is supremely sturdy while remaining unobtrusive. The telescoping vertical stands lock into place with a steel pin, so even at the full 52-inch extension, your speakers will be completely secure. A set of clips just under the platform and down near the base hold your cables in place, keeping the presentation neat and helping to prevent accidents. If you've ever snagged your foot on a loose cable and seen your monitor come tumbling down, you know exactly how beneficial these little clips are. The monitor platform has no-slip padding to keep your speakers in place. The padding provides some slight vibration dampening, but to really tighten up your mix, add some isolation pads. Your sound will be much cleaner and more accurate. Let's review: more accurate monitoring, less back pain, easier monitor setup, worry-free build quality...you see why you need a pair of On-Stage SMS6000 monitor stands? Good. Class dismissed. Finally -- a worthy home for your studio monitors! Now you have a stable, solid stand for the perfect placement of your studio monitors. The On-Stage SMS6000 is height-adjustable from 36 to 52 inches and has a 9"-square top platform for speakers up to 100 lbs. Leveling spikes in the base let you compensate for an uneven floor surface and the whole base is remarkably stable. Other features include a safety pin in the vertical post and arc-welded, steel construction. The vast majority of today's studio monitors are near field monitors and near field monitors sound best when you listen from the sweet spot. Great monitor stands like these from On Stage let you pinpoint the placement of your speakers so you know you're hearing exactly what they're producing. Your mixes will sound better when you have your monitors in the optimum position. "Came with HS50 monitors and MoPads"
"A bad design poorly bundled with over-sized speakers"
Sound: If you use isolating material like foam pads you can get the resonance (vibration) of the hollow stand down to acceptable levels. Ease of Use: You can only adjust the height in increments of several inches because of the spacing between the blocking pin holes. Perhaps the spacing is to keep from weakening the metal pole - but I would have preferred the ability to more precisely position the vertical level. Quality: The entire stand is held together by a SINGLE bolt through the totally inadequate triangular base. One of my stands leans noticibly, and the support pole can be easily rotated even with the bolt tightened as much as possible. My KRK Rokit 8 speakers are too large and heavy for this thing - zZounds shouldn't have packaged inadequate stands with these speakers. The stands are not stable with the speakers on them - they wobble and can be easily tipped over. Value: I think the retail price for these is around $90 - worth maybe half that, and useless for all but the lightest monitors. Manufacturer Support: Unknown so I give them the benefit of the doubt. I admit I got these speakers for "free" with the speakers, so I'm not going to be a jerk and try to return them. They might work fine with smaller/lighter speakers. Overall: A badly designed stand, and poorly matched with the KRK Rokit 8 speaker as a bundle.